For the Japanese, one of the greatest pleasures in life is food, and a wide variety of types and from different countries. Japanese cuisine , which is considered one of the best in the world, offers a wide variety of dishes from “sashimi” delicate taste fresh fish from the popular among all segments of the population richness ramen noodles. Most world-class chefs come to Japan to prepare their gourmet dishes. Tokyo – it is not only the capital of finance and business. It is the center of cooking where food is in abundance of all kinds and flavors. Start your acquaintance with Japanese cuisine with a walk from the subway station or the train station. There are many establishments where you can sample local cuisine and, in general, at an affordable price. For visitors who do not speak the Japanese language, some places put in the windows of plastic or wax dummies of dishes or provide a menu with color photos of the dishes. Place for lunch or dinner can be found in large department stores in the upper and lower floors.Here is a large variety of restaurants with reasonable prices. Several inexpensive restaurants offer visitors to buy a voucher for each dish or the cashier or by a special vending machine. In Japan, tipping is not accepted. Japanese, once presented to the Western world in the form of food “sukiyaki” or the more exotic dishes “sushi” in due course has been praised around the world, and in recent years has ceased to be part of the exotic, becoming familiar and beloved by many foreigners. A large number of tourists have tried and enjoyed raw fish or shrimp fried in batter. But few of the tourists visiting Japan for the first time will be ready for the diversity and magnificence of dishes in a traditional design. 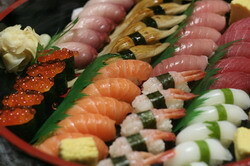 Food in Japan – it’s something that you enjoy and will remember fondly for the rest of life. Sukiyaki – thin slices of high-quality beef, fried with various vegetables, tofu and noodles.Prepared in a special pan directly on the table. 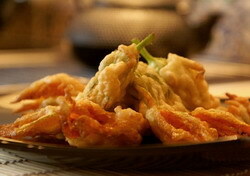 Tempura – fried in boiling oil various products in batter of eggs, flour and water. The ingredients used shrimp, seasonal fish and vegetables. Sushi – balls of flavored vinegar boiled rice with slices of raw fish and seafood. The most common ingredients are tuna, squid and shrimp. Sushi with cucumber, pickled radish with egg omelet or a light complement the diversity of the possible options for sushi. 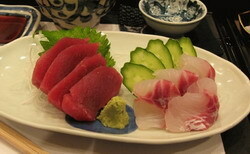 Sashimi – thinly sliced ​​raw fish served with soy sauce. 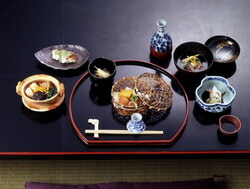 Kaiseki ryori – considered a masterpiece of gourmet cooking in Japan. 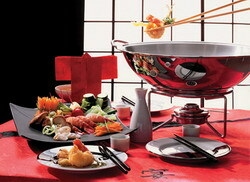 Meals, which are based on the respective season vegetables, fish, algae and fungi, different refined taste. 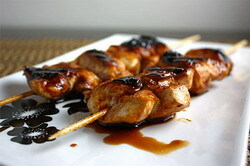 Yakitori – small slices of chicken meat, liver and vegetables skewered on bamboo sticks, cooked on the grill with charcoal. Tonkatsu – fried breaded pork fillet in the form of cutlets. Shabu-shabu – a dish of thinly sliced ​​high-quality beef that is cooked, each slice dipped in boiling water, then in a sauce. Soba and Udon – two types of Japanese noodles. Soba is made ​​from buckwheat flour, and udon – wheat. Served in soups or as a separate dish with the sauce. Also, it is in addition to a variety of delicious dishes. Japanese sake , or rice wine, is perfect for a variety of Japanese dishes. 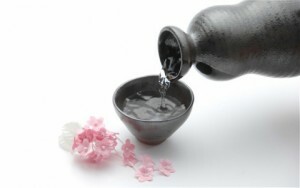 Sake, are made ​​of rice and water, it is a traditional Japanese alcoholic beverage since ancient times. Sake can be drunk warmed, then the feeling of intoxication comes quickly. In winter, warm sake is very good. Good sake, if you drink it chilled, has a taste of high quality wine. Local sake varieties produced in each district of Japan, and display characteristic that belongs only to the area, taste, depending on the quality of rice and water, as well as the characteristics of the fermentation process.